Chairman Johnson, Ranking Member Becerra, and members of the subcommittee, thank you very much for the opportunity to speak to you today about the 2016 Social Security Trustees Report. This report has been produced and submitted to the Congress every year since 1941, the year after monthly benefits were first paid from a Social Security trust fund. During calendar year 2015, the Old-Age and Survivors Insurance (OASI) Trust Fund reserves increased by $51 billion, nearly $10 billion more than projected in last year’s report. The Disability Insurance (DI) Trust Fund reserves decreased by $28 billion, over $4 billion less than projected in last year’s report. At the beginning of 2016, the combined OASI and DI Trust Fund reserves were over $2.81 trillion, more than three times the annual cost of the program. Over the next 5 years, the combined reserves will grow through 2019, reaching $2.89 trillion at the beginning of 2020. However, combined reserves will begin to decline in 2020. The decline is projected to be modest, only $3 billion in 2020, but increases thereafter as the baby-boom generations continue to move into retirement ages and are replaced at working ages by the lower-birth-rate generations born after 1964. 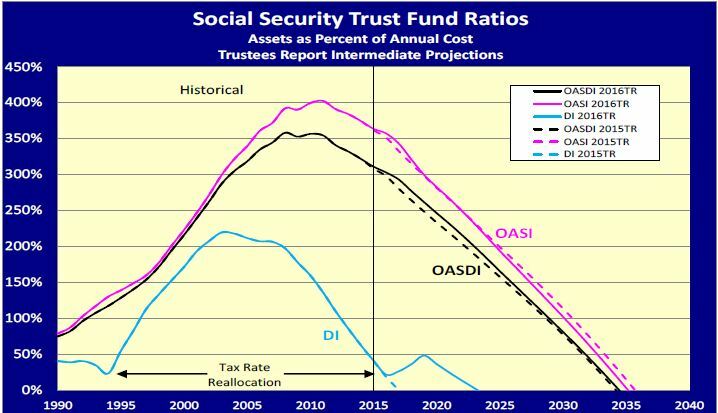 The OASI and DI Trust Funds, individually and combined, are projected to be fully solvent through the next 5 years, thanks to the enactment last November of the payroll tax rate reallocation included in Bipartisan Budget Act of 2015. At the time of enactment, we estimated that the date of trust fund reserve depletion for DI would be extended 6 years, from 2016 to 2022. In the 2016 Trustees Report, we now project that DI reserves will not deplete until 2023, largely due to the lower than expected recent level of benefit expenditures. Applications for disability benefits have been declining since 2010, and have continued to be below our prior projections. Actuarial status of the trust funds is assessed on the basis of the projected ability of the trust funds to pay benefits scheduled in the law in full and on time. Under the law, all income is invested in trust fund reserves on a daily basis, and benefit obligations and administrative costs are paid on the basis of redeeming bonds held by the trust funds as needed. The law provides no ability for the trust funds to borrow or receive revenue from other than specified taxes and interest on the reserves. Thus, should reserves become depleted with continuing revenue less than needed to meet current obligations, benefits scheduled in the law would not be payable in full on a timely basis. Fortunately, over the entire 80-year history of the program, the Congress has always made timely adjustments in the law to avoid reserve depletion and any sudden reduction in benefits paid. The real purpose of our reporting on the actuarial status of the trust funds is to illustrate to the Congress any expected shortfall in financing of scheduled benefits so that further adjustments to the law can be made on a timely basis. Under the intermediate assumptions used for the 2016 Trustees Report, we project that the combined reserves will be depleted in 2034, the same year as in the last report, with continuing income under current law equal to 79 percent of program cost at the time of depletion. By the end of the 75-year projection period, income under current law is projected to equal 74 percent of the cost of the program, a small improvement from the projected 73 percent payable in last year’s report. The revenue for the OASDI program for 2090 is now projected to fall short of scheduled cost by 4.35 percent of taxable payroll, significantly less than the 4.69 percent shortfall projected for 2090 last year. In essence, what this means is that by 2034 we will need adjustments in the law so that (1) the scheduled revenue for the OASDI program is increased by about one-third, (2) scheduled benefits are reduced by about one-fourth, or (3) some combination of these adjustments is enacted. The Trustees have consistently advised that enacting changes soon, even if with delayed effective dates, will allow more options to be considered, more advance warning for those affected, and a more gradual phase-in of adjustments. Over the past 20 years, Trustees Reports have projected reserve depletion as early as 2029 and as late as 2042. Considered alone, the separate DI Trust Fund will require some adjustment again well before 2034. Even with the changes enacted in the BBA 2015, DI reserves are projected to be depleted in 2023, at which time continuing income would be equal to 89 percent of scheduled cost. 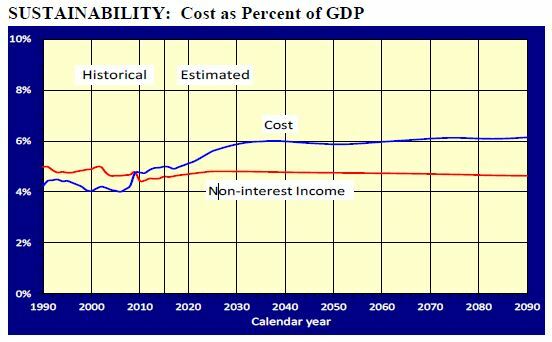 By the end of the 75-year period, scheduled income is projected to be sufficient to cover 82 percent of scheduled cost. Expressed as a percent of the total Gross Domestic Product (GDP) of the United States, the scheduled cost of the OASDI program is projected to rise from 5 percent in 2016 to about 6 percent for 2035 and later. Projected scheduled revenue is lower, between 4.6 and 4.8 percent of GDP over this period. 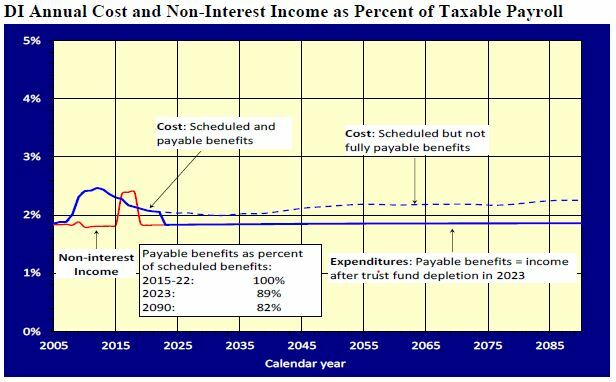 The fact that scheduled annual non-interest income, largely the 12.4 percent payroll contribution rate, is no longer sufficient to cover annual program cost is primarily due to the changing age distribution of the adult population. However, the fact that projected OASDI cost as a percent of GDP is basically stable after 2035 speaks to the sustainability of the program benefit and revenue structure. The changing age distribution will simply require adjustments in scheduled income and/or cost. The cost as percent of GDP closely follows the ratio of beneficiaries to covered workers, because the average benefit under the program is designed to rise at about the same rate as average earnings. The intermediate projection is alternative II in the following figure. Changes in longevity through declines in death rates play a more gradual but steady role in the trend of the aged-dependency ratio. 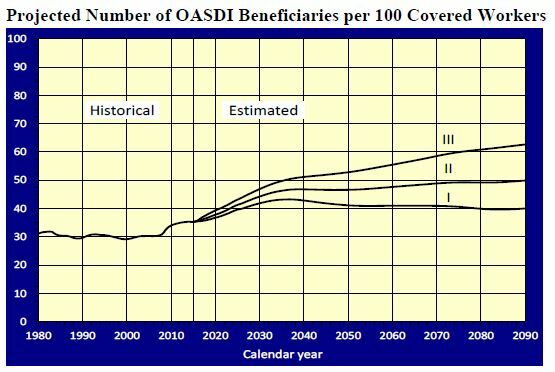 Changes in death rates over age 65 are important for the actuarial status of the OASDI program. Fortunately, mortality projections used in the Trustees Reports have provided a sound basis for evaluating the actuarial status of the program in the past. While some have suggested assuming dramatically faster mortality improvement, the track record for the Trustees Reports, plus the very substantial deceleration in mortality improvement since 2009, suggest that projections in the 2016 report represent a sound basis for evaluating prospects for the future. See the recent Actuarial Note #158 for further information. The Trustees Report uses several summary measures and tests to indicate the actuarial status of the trust funds from different perspectives. The actuarial deficit for the OASDI program as a whole decreased from a 75-year shortfall of 2.68 percent of taxable payroll in last year’s report to 2.66 percent of payroll in this report. 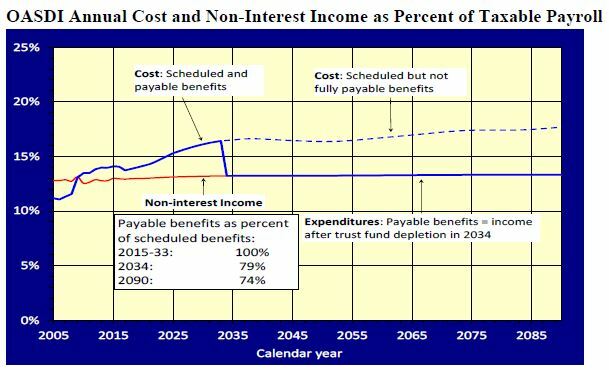 The actuarial deficit is the excess of the cost for full scheduled benefits over the next 75 years, including the cost of having a reserve at the end of the period equal to 100 percent of annual cost, over the scheduled income for the program over the next 75 years, including the starting trust fund reserve level, all expressed as a percent of payroll. Another summary measure is the unfunded obligation of the program. This is the difference between projected program cost in the next 75 years over the projected revenue (plus starting reserves). For the 2016 report, the unfunded obligation rose slightly expressed in present value dollars, but declined slightly as a percent of GDP over the 75-year period. On balance, changes in legislation, assumptions, recent experience, and methods had a small positive effect on the actuarial status of the OASDI program. The table below highlights the main factors in the change in the actuarial balance for this year. The effect of lowering the assumed rate of emigration of undocumented immigrants who have resided here for long periods is about offset by the effect of assuming permanently lower real interest rates. Lower recent experience for both birth rates and the rate of mortality improvement have significant but offsetting effects. The positive effects of the BBA 2015 and slower growth in employer-sponsored group health insurance premiums overwhelmed the effect of changing the long-range valuation period, leaving a small net positive effect. The Trustees apply a short-range test of financial adequacy that requires that reserves remain at or grow to at least 100 percent of annual cost over the next 10 years. The OASI Trust Fund as well as the combined OASI and DI Trust Funds satisfy this test. The DI program once again does not. Section 709 of the Social Security Act also requires that the Trustees report to Congress when a Trust Fund is projected to have reserves below 20 percent of annual cost in the future. In order to give Congress ample time to consider necessary adjustments, the Trustees make such reports when the reserve ratio is projected to be below 20 percent within the next 10 years. Again this year, the Trustees have submitted this notice to the Congress for the DI Trust Fund. The DI Trust Fund reserve ratio was 21 percent at the beginning of this year but will rise until 2019 due to the tax rate reallocation enacted last year. The ratio will then decline and will fall below 20 percent by the beginning of 2022, and without Congressional action, reserves will become depleted in 2023. The Trustees also report on the long-range test for close actuarial balance. This test requires that the program satisfy the short-range test of financial adequacy and, in addition, maintain a positive reserve throughout the remainder of the 75-year projection period, indicating the ability to pay all scheduled benefits in full on a timely basis. At this time, neither the OASI nor DI Trust Funds individually or combined meet this long-range test. While the financial and benefit structure of the OASDI program is sound, adjustments are needed to accommodate the changing age distribution of the population over the next 20 years that is the result of persistent lower birth rates after 1964. The Social Security Act requires a statement of actuarial opinion from the Chief Actuary of the Social Security Administration regarding the reasonableness of assumptions and methods used in the report. I am happy to indicate that the actuarial opinion for the OASDI Report has never included a qualification of the assumptions and methods used to project the actual cost and operations of the trust funds under current law. However, starting with the 2014 report, the actuarial opinion has included a caveat regarding a reference added to the OASDI Report to an appendix on federal budget accounting in the Medicare Report. This appendix, first introduced in 2004, describes the implications of projected OASDI and Medicare Trust Fund operations under the customary budget scoring convention. This caveat warns the reader that discussion of the trust funds in relation to the overall federal budget and implications for federal debt held by the public are distorted and misleading because of use of this budget scoring convention. This convention presumes that OASDI obligations scheduled in the law that cannot be paid in full and on time after Trust Fund reserve depletion, will nonetheless be paid at the expense of the General Fund of the Treasury. The General Fund is presumed to borrow from the public as needed to pay full scheduled benefits after reserve depletion. The problems with this convention are: (1) the law does not permit such general fund transfers, either before or after trust fund reserve depletion; (2) there has never been a precedent for a change in the law providing such transfers; and (3) results presented in the budget scoring context do not provide clear disclosure that they are hypothetical projections presuming a change in law that would allow for the indicated general revenue transfers to the trust funds after reserve depletion. 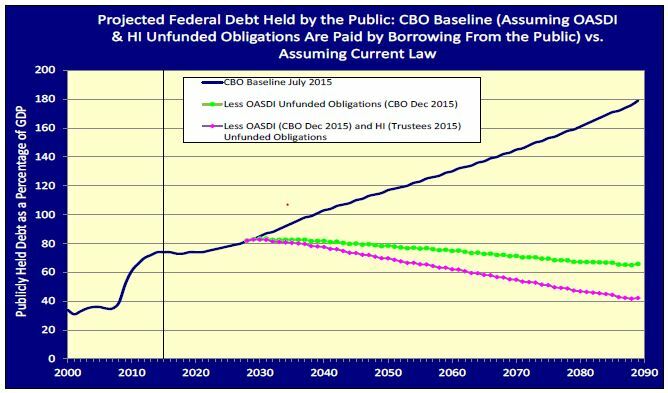 The graph below illustrates that without this budget scoring convention, federal debt held by the public would not be projected to rise to 100 percent of GDP, and would in fact decline after about 2030. Please note that the 2016 and all prior year’s Trustees Reports are available at https://www.ssa.gov/oact/pubs.html, along with a wide variety of additional actuarial analyses related to the reports and to changes policymakers have considered for making adjustments to the program. 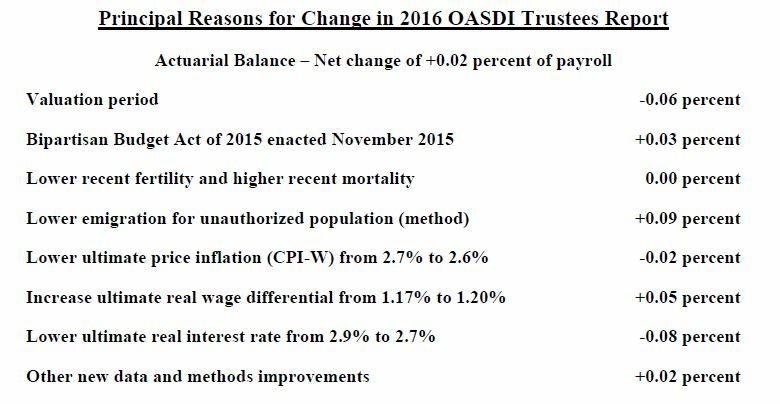 Based on the intermediate assumptions of the 2016 Trustees Report, the actuarial status of the OASI and DI Trust Funds is slightly improved compared to last year’s report. 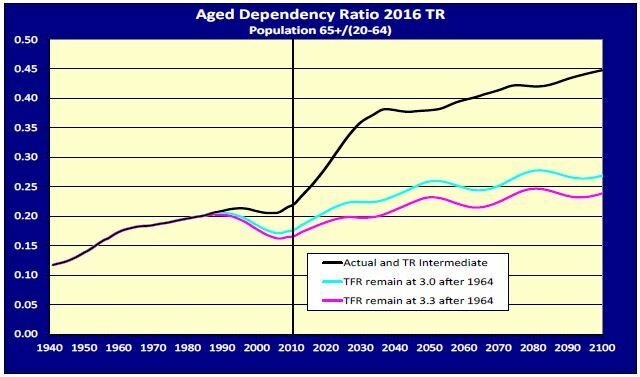 The long-known and understood shift in the age distribution of the United States population will be increasing the aged dependency ratio, and in turn the cost of the OASDI program as a percentage of taxable payroll and GDP. Once this shift, reflecting the drop in the birth rate after 1964, is complete around 2035, the cost of the program will be relatively stable at around 6 percent of GDP. We look forward to working with this Committee and others in developing the adjustments to the law that will be needed to keep the program in good financial order providing retirement, disability, and survivor benefits for future generations. Again, thank you for the opportunity to talk about the 2016 Trustees Report. I will be happy to answer any questions you may have.